You have probably heard all the reasons why you shouldn’t let your dog sleep on your bed. “It’s not sanitary.” “You don’t sleep well.” “Your dog doesn’t sleep well.” Still, what if both you and your pooch can’t bear to sleep apart? Well, if you are going to sleep together, you need to establish some rules. If you have a larger dog, establishing a specific sleeping space for them is quite important; otherwise, you may end up with a hundred pound animal snoozing on your legs or even your stomach. Some dogs actually shove their owners into a corner each night, successfully commandeering 75% or more of the bed. No matter how much you love your dog, you still have to function the next day. Remember, someone has to bring home the kibble. So you need to avoid this situation. Experts suggest that you establish a dog sleep zone using a blanket or rug. Then don’t allow your dog off of that area. Even a tiny dog can disrupt your sleep if you let it, so establish a zone for your terrier as well. Unfortunately, your dog may decide to claim your bed all day long once you let them in. In the interest of keeping some personal space just for you and a possible partner, only let your dog on the bed at bedtime. In fact, keep them out of your bedroom during the daytime. Doing so will establish that the bedroom is for sleep only and not for play. Many people have enough trouble falling asleep without a frisky pup demanding attention. Unless you have a king-sized bed, you should limit the number of pets you sleep with at night. Two dogs, three cats, and a guinea pig in one bed is something even Dr. Doolittle would not support. 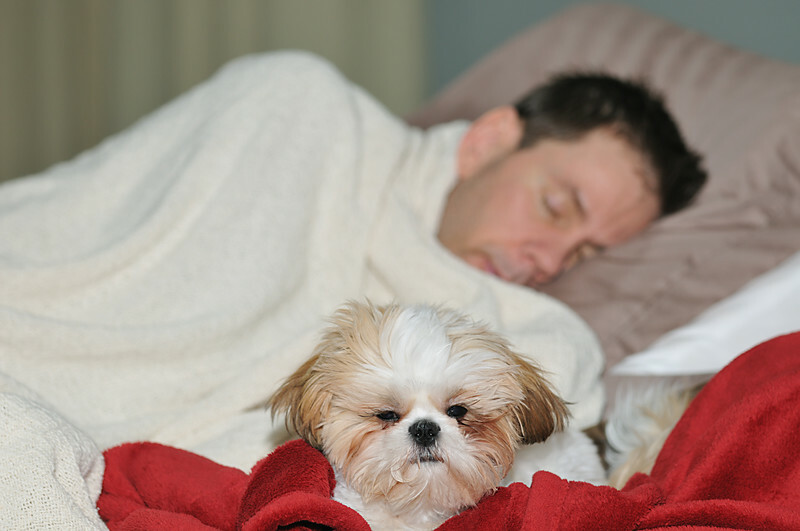 Pets can carry diseases, so having more of them in bed will up your chances of developing a health issue. Also, no one can get enough sleep if the bed is too crowded. If you can’t bear to play favorites, you may need to ban the practice altogether. Remember, no human or pet should go without enough shut-eye. Sleeping with your dog does have its advantages. It can give you a sense of comfort and security. Dogs can be excellent snuggle buddies, and they are certainly members of the family. If you let them into your bed, you do need to establish some boundaries so everyone involved sleeps well.